If you've recently deployed Exchange Server 2010 in your organization and a user calls with a mobile device problem, look at the Exchange Control Panel first to start diagnosing the problem. Troubleshooting mobile messaging in an Exchange Server organization can be difficult. This tip tells you where to look to start diagnosing mobile messaging issues in Exchange Server 2010. Are the mobile devices registered? If a user calls you with a mobile messaging problem, one of the first things I recommend is to verify that the user's mobile device is registered with Exchange. To verify mobile device registration in Exchange Server 2007, you had to be logged on as the user. 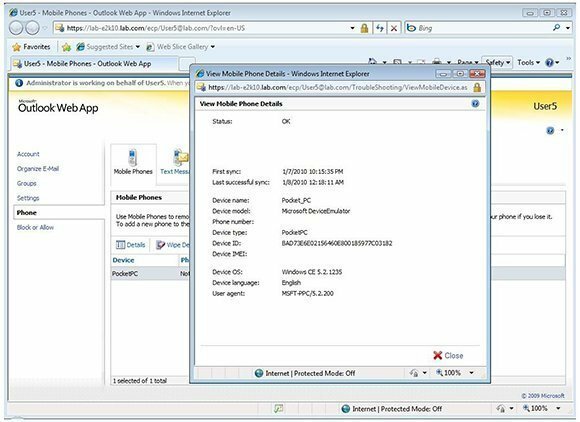 Exchange Server 2010 allows administrators to verify mobile device registrations using the new Exchange Control Panel. 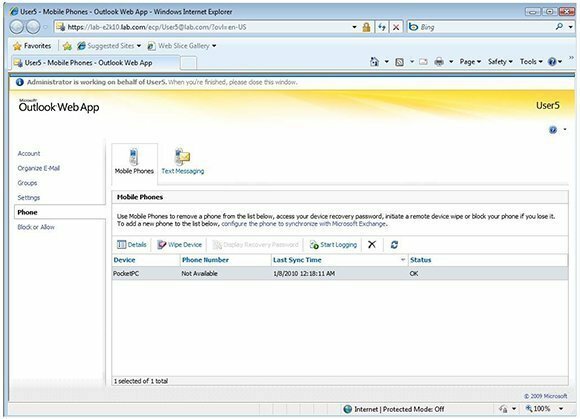 To use the Exchange Control Panel, log into Outlook Web App (OWA) as an administrator. Next, click the Options button to access the Exchange Control Panel. In the upper left corner of the window you'll see a drop-down list where you can select what you want to manage. Figure 1. You can view an Exchange 2010 user's mobile device registration through the Exchange Control Panel. Select the Another User option from the list. Windows will open a browser window that will prompt you to select the user you want to manage. Select the mailbox for the user experiencing mobile messaging problems and click OK.
Once you do this, you'll return to the main Exchange Control Panel screen. Select the Phone option to see the user's mobile device (Figure 1). As you can see, the interface shows you the device's last sync time and its current status. Figure 2. Clicking the Details button reveals additional information about the mobile device. The Details button, which is located just above the listing for the user's mobile device, gives you additional information about the device (Figure 2). At first glance, this information may not seem useful, but the window contains subtle clues you can use to track down problems the user is having with his mobile device. For example, look at date and time of the user's first and last sync. You can use this information to know whether the user is trying to use a new mobile device or if they've been using the same device for a while. If the user has been using the device for a while, you can probably rule out compatibility problems as a potential cause of the issues. You should also verify the device operating system. Exchange Server 2010 supports mobile messaging on a variety of mobile devices, but not all devices support all messaging features. Microsoft considers Windows Mobile 6.1 and 6.5 to be fully provisionable, but older versions of Windows Mobile and non-Windows OSes can't enforce some of the security settings found in the ActiveSync Mailbox Policy. Figure 3. ActiveSync logging sends the log to a user's inbox as an attachment. 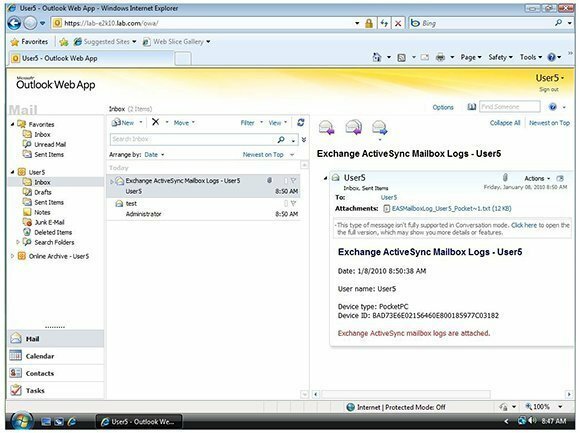 You can also use ActiveSync logging to troubleshoot mobile messaging in Exchange Server 2010. If you look back at Figure 1, you'll notice a Start Logging button. Clicking this button instructs Exchange server to log all ActiveSync traffic for a selected mobile device. When you begin logging, the Start Logging button changes to a Retrieve Log button. Clicking this button sends the ActiveSync log to the user's inbox as an email attachment (Figure 3). Figure 4. 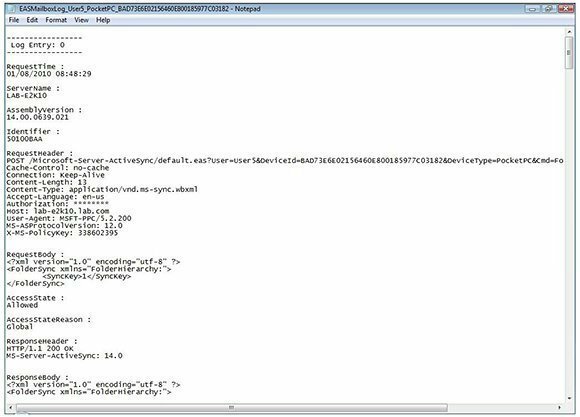 A view of Exchange Server 2010 ActiveSync logs in XML format. In my opinion, Microsoft dropped the ball on the ActiveSync logging feature. Although an administrator can initiate and terminate ActiveSync logging for a user's mobile device, the actual logs are sent to the user's mailbox -- not to the administrator who initiated the logging. Therefore, you'll have to ask the end user to forward the logs to you. On the plus side, the logs are quite useful. As you can see in Figure 4, the ActiveSync logs contain detailed information about each ActiveSync request and the corresponding response. The file is in XML format and is readable through Microsoft Notepad or in a Web browser.